Photo and all content copyright SkydivingDropzones.com, 2012. All Rights Reserved. Skydiving was once dominated by men and women weren’t welcomed at the drop zone. This era has long since passed. Skydiving is one of the most adventurous sports. If you have been accustomed with skydiving and the events that often make headlines then you must have come across even 60 year old and 80 year old women skydiving for the first time. 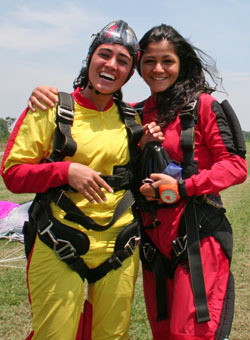 Apart from being a very thrilling adventure, skydiving has a lot to offer to a woman. In reality, women make some of the best skydivers. Their flexibility and openness to learning allows them to become champion skydivers. The first reason why women should go skydiving is to conquer fear. We may have shifted gears from a patriarchal society to a much more open culture a hundred years back but there are many things that are still a popular taboo for women. A woman is expected to harbor fear in a lot of aspects and adventurous sports is one on that list. There is no greater way to conquer fear than to take a plunge from a height of 10000 feet or more and soar in the sky like a bird. Not only will you feel the sheer adrenalin rush, there is a huge boost to self confidence. Any woman should try out skydiving at least once and the effect it will have on her psychology and self-esteem will last a lifetime. Another great reason why women should go skydiving is to gain a sense of accomplishment. Skydiving requires training and a lot of appetite for thrill and perseverance. It involves one’s mind, body, reflexes and almost everything in human physiology and psychology. When you manage to make a successful jump, roar through the air and finally open the parachute and land, the sense of accomplishment is unparalleled. A few minutes of skydiving can offer you a sense of satiation that is equal to more than a year of work. Now, if you have not tried skydiving before and are not too sure if you would be ready to pull it off then tandem skydiving can be ideal for you. Tandem skydiving involves an instructor harnessed to a first timer hence poses less risk. Try out tandem skydiving or go for it all alone, the experience would be one of a lifetime.